Ginza is recognized by many as one of the most luxurious shopping districts in the world. 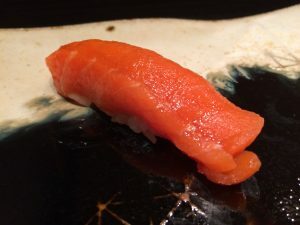 Salmon is not used as a topping in Edo-style sushi! The Japanese were not in the habit of eating salmon raw. Salmon was not a traditional topping in Edo-style sushi. The reason for this is that the existence of parasites has been well-known since long ago and there was no way to prepare the salmon raw. According to the Ministry of Health, Labour and Welfare, salmon must be frozen at -20℃ for at least 24 hours in order to completely kill all parasites. Salmon served at sushi restaurants must be stored frozen and then thawed before serving. 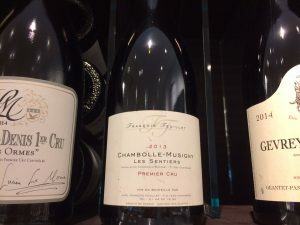 The type of salmon (sake) you find in Japan is Chum salmon. However, most of the salmon served raw at sushi restaurants is Atlantic salmon. This is a popular topping throughout the world due to the high fat content and smooth texture achieved by sea farming in places like Norway and Chile. The fish are strictly managed from water quality to the effects on the environment, so there are very few issues with parasites and the salmon can be eaten raw. However the fact remains that the fish are administered a number of chemicals due to concern of spread of disease-causing germs in the farms. 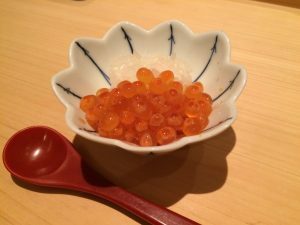 Even when salmon roe and sea urchin first started to be used as toppings, most sushi chefs said that these didn’t count as Nigirizushi and refused to use them. However the favorable reputation of sea urchin sushi in Ginza won out, it started to be used by more chefs and eventually became one of the major dishes. 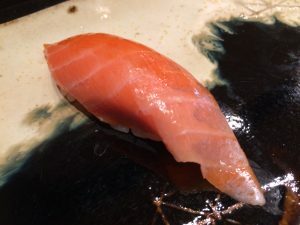 The fifth generation sushi chef at one long-standing shop says, “If it’s what the customers want, then salmon may also be rolled as Nigirizushi in the near future.” It may even become part of the standard menu. At a pre-Edo sushi shop that features Hokkaido toppings, they are actually serving ultra-high grade salmon such as Keiji* and Tokishirazu**. *Keiji are young salmon with immature ovaries or testes. Only 1-2 Keiji are found in a normal catch of 10,000 salmon. Normal salmon fat content is 2-15% but the Keiji have a very high body fat percentage at 20-30%. Posted on May 9, 2017 September 12, 2018 Categories TriviaTags Ginza, Nigiri sushi, Salmon, Sushi Ingredients, Sushi roll6 Comments on Salmon is not used as a topping in Edo-style sushi!